The longhorn steer mascot of the University of Texas died in his sleep Friday after recently being diagnosed with cancer. Bevo XIV was 13. 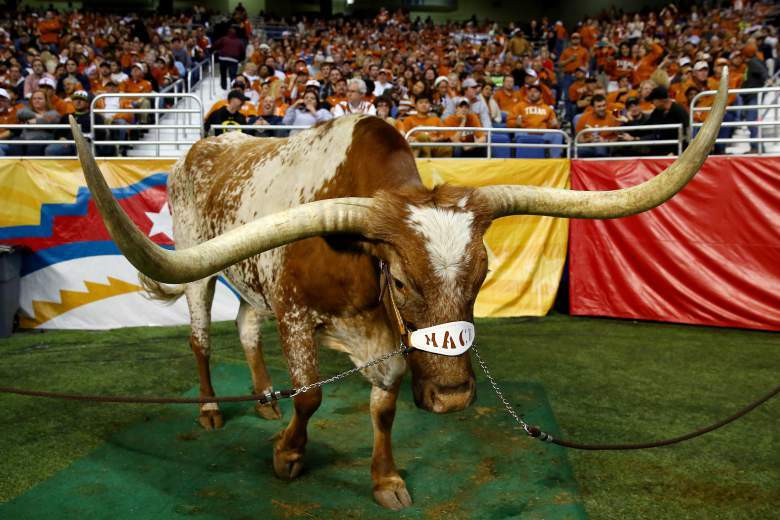 The recently retired Texas Longhorn mascot Bevo XIV has died, University of Texas at Austin officials said Friday. The 2,100-pound longhorn was diagnosed with the bovine leukemia virus earlier this month. The university said in a press release that he “passed away in his sleep” Friday. He was being kept at a ranch owned by his owners and caretakers, UT-Austin benefactors John T. and Betty Baker. Bevo’s retirement was announced earlier this month. He missed the Longhorns’ most recent football game — an upset win against rival Oklahoma — and the team is expected to be without a longhorn on its sidelines for the rest of the year while a replacement is sought. Bevo was born in 2002, and began his tenure as the mascot in 2004. In addition to routinely starring at football games, he was a regular at UT-Austin and Texas events. He attended the second inauguration of President George W. Bush, according to the university. What a magnificent Longhorn! Beloved Bevo will be missed. Rest in Peace Bevo. This entry was posted in Stories and tagged Bevo, Bevo XIV, mascot, University of Texas Longhorns, UT by greyzoned/angelsbark. Bookmark the permalink. How sad, Michele, but Bevo had a long and lucky life, most of it spent as a celebrity, and he was treated as such. Those are huge horns! It is sweet how he came for treats and liked liked his belly rubbed. How old do they get to?? Longhorn steer can live to past 20. Poor Bevo was only 13. He had a lot of years ahead of him. Damn cancer! That’s sad. It seems as if he had a good life for a steer. I think he had an amazing life. He was treated like royalty, which is a blessing. If only all steer could be treated like that! Very sorry about Bevo XIV. 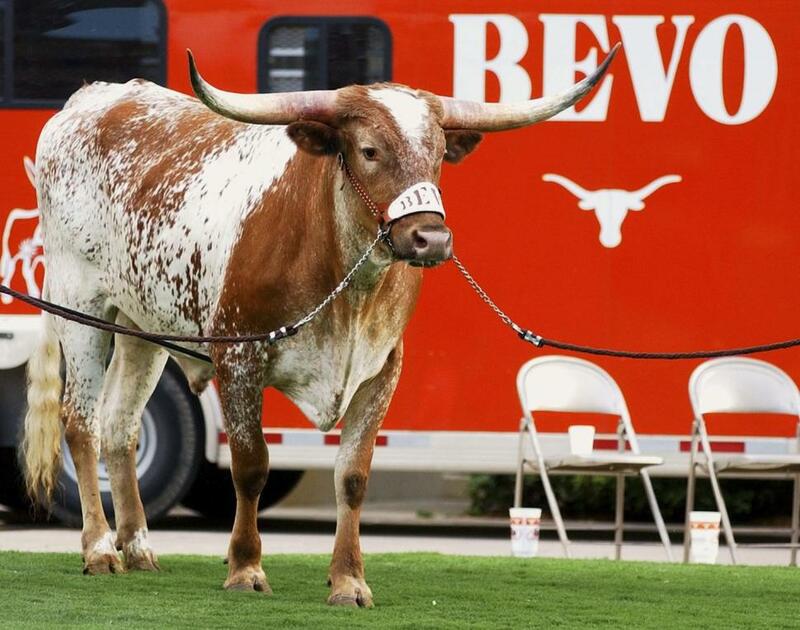 Beautiful animal; I hope Bevo XV is as magnificent. We here in Georgia just have a bulldog (don’t know which UGA they’re up to now). Yeah, I’ve heard of and seen UGA. Sweet bulldog! He’s treated like royalty too, huh? That’s what I understand. I know that the guy that has provided most of the recent UGAs lives in Savannah, a rather nice place to live (Savannah was the setting for “Midnight in the Garden of Good and Evil”). Sad story! Like most said he lived a good life. Cancer stinks even for animals!